The Soar Boating Club came into existence in the Spring of 1953 as a result of a casual discussion between two boat owners - Geoff Black of Jolly Roger and Rex Bloor of Carefree. Along with their wives, they invited few other boat owners known to them to meet in the lounge of the White House Inn at Kegworth to discuss the formation of a Club to further their interest in boating. 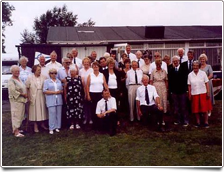 Thirteen people were present at this meeting which took place on 13th July 1953 - and that the omens were defied has been demonstrated by the subsequent fifty-one years ! With Rex Bloor in the chair and Stan Hicks of Trent Gull as scribe, the Club was founded, named "Soar Boating Club", and a working Committee of six persons was appointed. A Leicestershire businessman, R. O. (John) Bennett of Mary ANN was invited to become the Club's first Commodore and Herbert Hughes of Caprice became Rear Commodore. The objectives for which the Club was to stand were drafted and have remained the same throughout the years, namely:- "The promotion and encouragement of boating on the River Soar, the provision of a social centre for members, and facilities for information and advice on all matters pertaining to the sport in general." The first of what have become Annual Rallies was held at Kegworth on the 5th and 6th September 1953 and was quickly followed by the first Annual Dinner Dance. At the first AGM on 17th February 1954 it was decided that a President would enhance the Club's standing and John Bennett was appointed to that office, Bert Hughes becoming Commodore and Howard Trot of Ardris being appointed Rear Commodore. The new President presented a silver cup for annual competition, to be known as the John Bennett Trophy, and later in the summer of 1954 a points system was devised to determine, amongst the Club's active boaters, who was to win the cup. Other trophies have been presented over the years. At the 1956 AGM, Mrs Olive Bloor presented on behalf of herself and Rex, a George III silver cup made in 1776 (now known as the Bloor Trophy) and, in 1959, when Rex retired from active office, they presented a pair of matching cups (known as The Commodore's Cup and the Waiora Trophy). Mrs Wilson the then landlady of the White House, presented a silver cup to be known as the Jervis Tonge Wilson Cup in memory of her late husband. In 1961 Mr Arthur Warner gave a silver tray as a trophy to encourage and promote "seamanship and sportsmanship" amongst the younger members. In all, the Club is now fortunate to possess eleven trophies - a wonderful collection - and grateful thanks go to all the donors. Details of these trophies and how you might set about winning them are available on the web page. 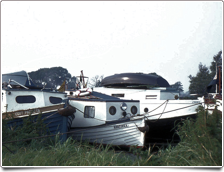 The first Whitsuntide Cruise took place in 1955 and was to Burton upon Trent partly to call attention to the then deteriorating condition of the Trent and Mersey Canal, and as a demonstration to counter rumours of impending closure. Thereafter, for a number of years, an organised cruise became an annual event. 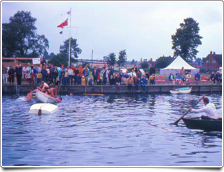 Early in 1956 the Club became a member of the Trent Boating Association, our representative being the then current President, Harold Crew of Blue Sky. In more recent years the Club has been actively involved with the Inland Waterways Association and the Association of Waterways Cruising Clubs on the national scene and the restoration of the Grantham Canal on a local level - to which end the Club has recently taken Corporate Membership of the Grantham Navigation Association. The mounted ship's bell used at Club functions, general Meeting and Dinners in particular, was presented to the Club by its President Bert Hughes in 1957 and it was in the following year that the Flag rank of Vice Commodore was first adopted. In 1961, the Club took the very important and far sighted step of acquiring a permanent headquarters by the purchase of the field at Normanton on Soar, a transaction achieved by the good offices of our member, Charles Ley. Since then a great deal of cash and even greater deal of time and effort by members has resulted in the fine base that the Club now enjoys. Excellent moorings have been constructed and storage and workshop facilities provided. In 1972 the first instalment of the present Clubhouse was built and this, together with all the Club's facilities have been added and improved over the succeeding years, with the addition of a kitchen and toilet block, Clubhouse extension, shower, Elsan point and further storage facilities. The results are a tremendous credit to members past and present. It is also a tribute to the 1976 Commodore, the late Bill Davies and his wife Jean, who established the principle of fund raising for the works, so that all the Club's assets are free from debt. A full list of Officers of the Club from its inception, under whose auspices these good works have taken place, appears on this site and it is a shame we have insufficient room for a list of all members, all of whom share the credit. 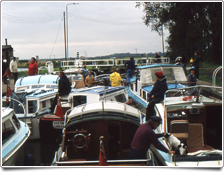 These days the Club has a membership consisting of the crews of nearly 100 boats and a number of caravans too and, at the time of writing it is nice to see the resurgence of the youngsters after one of the occasional period during which the kids have grown up and away from the Club. About 75% of the membership is from Leicestershire, 16% from Nottinghamshire, 11% from Derbyshire and 16% from as far as Cornwall, Merseyside, Humberside and Hertfordshire! There is, however, relatively little friction between these varied ethnic groupings. To assist the President and the Flag Officers in the running of the Club, there is a Management Committee of 11 members and a number of sub-committees, usually chaired by members of the Management Committee, to take care of specific functions such as Social, Rally, Amenities (management of the clubhouse, field and moorings), membership, publications and bar. The Management Committee meets once a month and amongst other things, receives reports from these sub-committees. The main Rally is now held over the Spring Bank Holiday and usually attracts over 100 boats and about 25 caravans and tents. 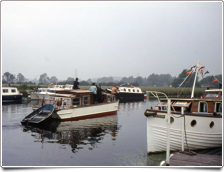 This is now widely renowned as one of the premier boating events in the Midlands, if nor the country, yet still manages to retains its friendly and sociable atmosphere. Organised Club cruises take place in May and August and are usually well attended and extremely jolly affairs with barbecues, treasure hunts, games, bonfires and singsongs being the order of the day in recent times. Links with the village are strengthened by the Birthday Weekend where members cruise to the church for a special service and open the Club to the villagers for the ensuing Birthday celebrations on the field (which for many years have been honoured by the presence of the Mayor of Rushcliffe and other dignitaries), and the annual Carol Service and Bonfire night festivities. Add to this the Laying-up Supper, Dinner Dance and otherwise full social calendar (many events giving Club members the opportunity to indulge their seeming penchant for dressing up!) and it's easy to see why the Soar Boating Club is the one to be in. During 2002 a sub committee was formed to put forward plans for the development of the clubhouse and field. 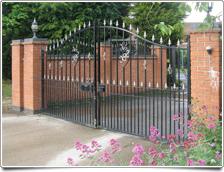 The first improvement was to replace the existing gates with a new entrance and gate. They were officially opened during the Birthday Weekend celebrations in 2003 by the Mayor of Rushcliffe. The event also marked the Club's 50th anniversary. During 2004 attention was focused to the Clubhouse where the front windows have been replaced in UPVC. In addition outline planning permission has been granted to extend the Clubhouse. This to improve existing facilities and provide disabled access. The subcommittee are actively involved in reviewing various options for extending the Clubhouse.